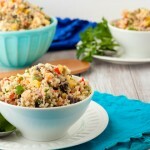 Quinoa ranch salad with sweet potato, fresh parsley, black beans, bell peppers and pepitas. Add dressing ingredients to the jug of your blender and blend until smooth. Set aside. 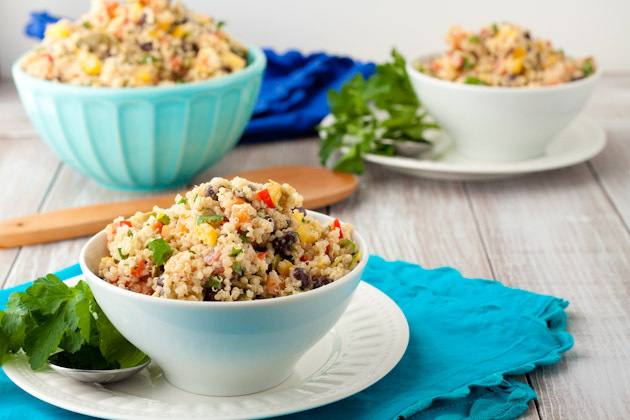 Place quinoa in a medium-sized saucepan with 2 cups of water. Cover, bring to a boil, reduce heat to low and simmer for 12 minutes. Remove from heat and keep covered for 10 minutes. Remove lid and place int the freezer to cool while you prepare everything else. Bring a pot of water to a boil, add diced sweet potatoes and boil for 5-6 minutes, or until tender. Drain, rinse with cold water and set aside. Prepare remaining ingredients, placing them in a large bowl when complete. Add cooled quinoa and yam to vegetable mixture. Pour dressing over top. Stir to coat, and serve!